This blog contains posts related to PhD work exploring the impacts of open government data policies on democratic and civic engagement carried out by Tim Davies, a PhD student in the Web Science Doctoral Training Centre at the University of Southampton. 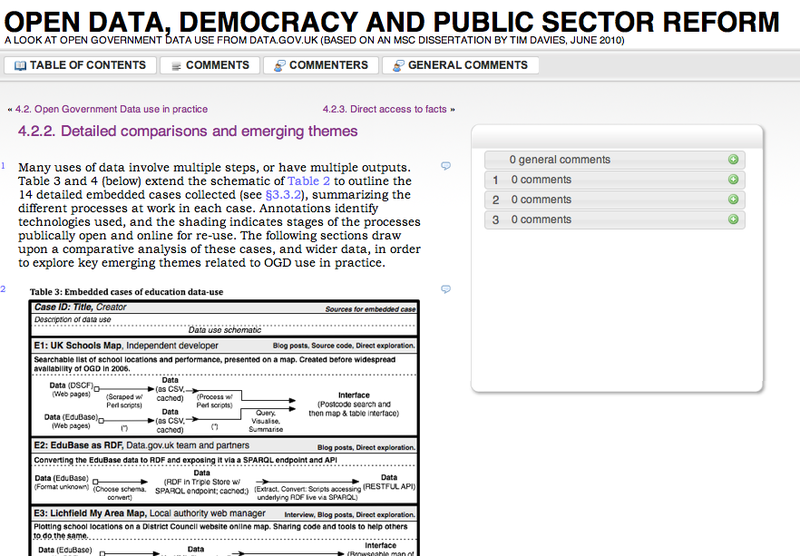 It is a space where I share both research, practice and policy related commentary on open data. I also blog more generally at http://www.timdavies.org.uk and can be found on twitter as @timdavies. It previously hosted research blogging from my MSc work. The analysis of this data formed a 10,000 word dissertation, but, more importantly, also a series of blog posts and other presentations offering some preliminary insights into how open government data is being used. Below is the draft title and abstract submitted to the examiners for my dissertation (Updated 19th May 2010). I hope to also make use of the data gathered in wider works. The dissertation itself will be submitted in July 2010, and I hope will be available to be shared in some open form later in the year. How is open government data being used? What are the implications of this for democratic engagement and the improvement of public services? The last 12 months have seen significant efforts to provide online and open access to government datasets in the UK. The release of Public Sector Information (PSI) datasets is advocated on a number of grounds, including: the potential economic benefits of services being developed on top of PSI; the potential for greater democratic accountability through open PSI; the empowerment of citizens to drive local reform of government services based on local data; and the contribution that an ‘open data’ and ‘linked data’ industry can make to the competitiveness of the country. Much has been written on the economic case for open government data. However, the ‘democratic’ and ‘public service reform’ cases remains under-developed, and the process by which the release of open government data will improve democracy, or local governance, underspecified. Adopting a holistic mixed-methods research design this study seeks to identify factors that affect the uses made of open government data with respect to democratic or local public sector reform goals. Particular attention will be paid to the motivation of actors working with open government data, and to the ways in which the resources for working with open government data are accessed directly from government provided online portals, or are mediated through third-party provided datasets, tools and networks.